Here’s a colorful new target that’s ideal for rimfire or centerfire silhouette shooters. 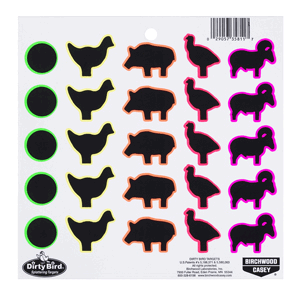 Birchwood Casey’s new Dirty Bird™ Multi-Color Splattering Animal Pack target features correct shapes of NRA metallic animal silhouettes. That way you can practice your marksmanship without having to haul around a set of metal targets. When a Dirty Bird animal silhouette target is hit, the color associated with each animal shape creates a ring around each bullet hole. Chickens burst in yellow, pigs burst in orange, turkeys burst in red, and rams burst in pink. Each target sheet is 8″ x 8″. Suggested retail prices is $12.20 for a pack of 20 targets (item 35822-MCA-20). These targets can be shot at 25 yards with iron sights, or at longer distances with scoped rifles. In related news, Birchwood Laboratories, Inc. has filed suit against Battenfeld Technologies, Inc. over the recent issuance of a patent to Battenfeld for their reactive targets and method of target manufacturing. “We feel the United States Patent Office was given insufficient information by Battenfeld during the application process, which resulted in the patent being awarded improperly,” said Mike Wenner, Vice President, Birchwood Casey. “Shoot-N-C® targets have been in production since 1996 and have been the #1 name brand target on the market since their introduction. We intend to vigorously… protect our business model.” Shoot-N-C and Dirty Bird® targets feature a special coating that flakes off during impact, leaving a bright halo ring around each bullet hole on the target. Share the post "Birchwood Casey Target Ideal for Silhouette Training"